Sutures are traumatic to soft connective tissues, such as liver or lungs. Polymer tissue adhesives require complex in vivo control of polymerization or cross-linking reactions and currently suffer from being toxic, weak, or inefficient within the wet conditions of the body. 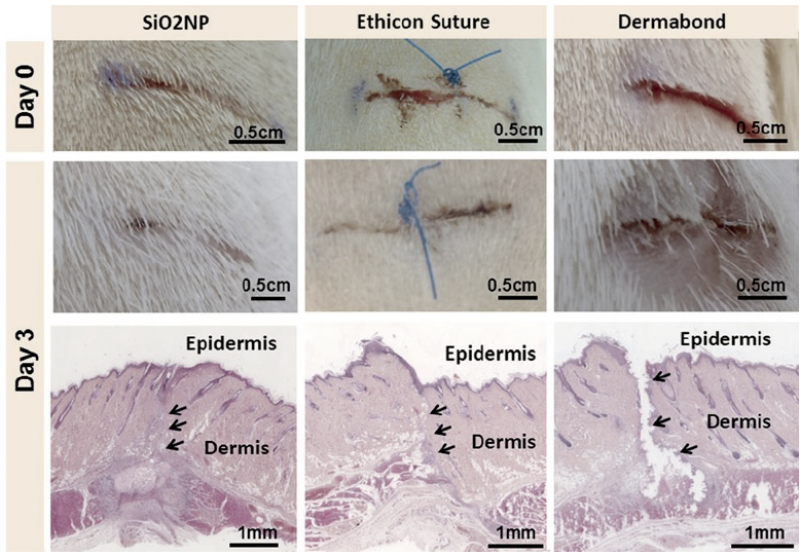 Herein, we demonstrate using Stober silica or iron oxide nanoparticles that nanobridging, that is, adhesion by aqueous nanoparticle solutions, can be used in vivo in rats to achieve rapid and strong closure and healing of deep wounds in skin and liver. Nanoparticles were also used to fix polymer membranes to tissues even in the presence of blood flow, such as occurring after liver resection, yielding permanent hemostasis within a minute. Furthermore, medical devices and tissue engineering constructs were fixed to organs such as a beating heart. The simplicity, rapidity, and robustness of nanobridging bode well for clinical applications, surgery, and regenerative medicine.